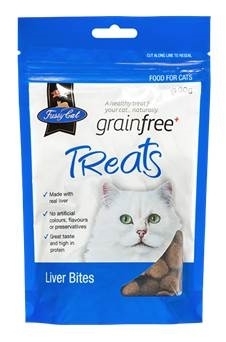 Fussy Cat grainfree Treats - made with real liver, no artificial colours, flavours or preservatives, great taste and high in protein. SHIPPED SEPARATELY TO FROZEN GOODS. THIS PRODUCT CAN BE DELIVERED DIRECTLY TO YOUR DOOR - CALL US ON 0800 PET FOOD IF THE WEBSITE IS NOT ACCEPTING YOUR DELIVERY ADDRESS AND WE WILL PROCESS IT MANUALLY FOR YOU. These treats have a real meat taste your cat will love. 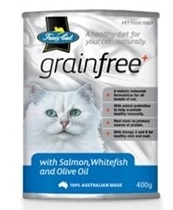 High in health-giving protein, you can be assured you are giving your cat a natural, healthy treat made from Australia’s finest quality, natural ingredients. Real meat protein aids growth and muscle development & maintenance. Contains all essential vitamins and minerals for a nutritious treat. Omega 3 & 6 to help maintain a healthy skin and coat. With Calcium to help maintain healthy bones, teeth and gums. Meat and meat meals (beef liver, poultry and beef), vegetable meals and vegetables, tallow (derived from poultry and /or beef), whole oilseeds (linseed and/or canola), salt, essential vitamins and minerals and amino acids (incl. taurine), potassium chloride, cellulose fibre, yucca extract, natural antioxidants. Serve as a treat any time of the day: intended as a complementary food, in conjunction with a complete and balanced diet.